“Saints Foundation’s Premier League Works programme exists to offer young people, aged between 16-25, the opportunity to develop skills that will assist them in gaining employment. Saints Foundation utilises links with local businesses and organisations to provide unique experiences for its participants. The 12-week programme aims to improve participants’ confidence, teamwork and employability skills through a range of sports and business-based experiences. Since starting in March, 2018, the current cohort has already undertaken work experience trips to Meachers Global and David Lloyd, as well as regular Street Football and boxing sessions, all with the aim of significantly improving their confidence ahead of employment opportunities. 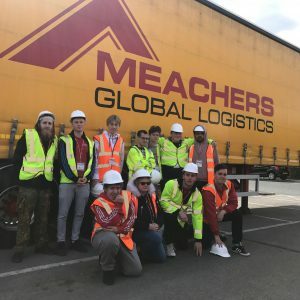 The visit to Meachers Global, a logistics management company, highlights the wide array of opportunities available to the Premier League Works participants, and Hannah Powell, Meachers’ Marketing Manager, sees the benefit of engaging with the Premier League Works programme. As well as visiting Meachers, the group have also enjoyed the benefit of a work experience visit with Asda, a CV workshop from IBM, a sports session delivered by Hampshire Cricket and a MyBnk Money Management qualification. Moving forward, the current participants will have a busy schedule in the lead up to their graduation from the programme, including an extensive community renovation project at Swaythling Community Centre in Southampton. The variety of opportunities within the programme means participants are challenged to work outside of their comfort zones in a supportive environment, which leads to positive results, as Adam Parrish has found out.